Totally inspired by Star Lord from Guardians of the Galaxy when asked what he was doing (he was dancing around) he replied something like I am distracting you you turd blossom. Turd blossom was one of those phrases that from the moment I heard it I knew it would forever be part of my vocabulary. So in honor of this, I made my own version of a turd blossom in yarn and gave it to my husband for his desk. It’s a simple cone and a tube of single crochets that I did sewed around the cone. I also did a small flower to represent a blossom. Fast and simple. 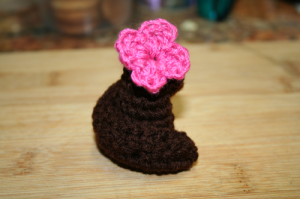 It’s amazing how the smallest crochet projects can bring so much fun especially for items that you won’t find many places if anywhere.